HOUSTON, Texas, August 30, 2010 (ENS) – Locally turbulent weather at the BP/Deepwater Horizon well site has put on hold operations to bring up equipment that will become evidence in several ongoing investigations. The heavy sets of valves, one as tall as a five-story building – must be brought up from 5,000 feet below the surface, a tricky maneuver in the best weather conditions. 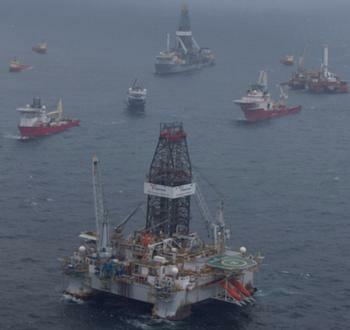 Briefing reporters from the Development Driller III rig out on the well site, National Incident Commander Admiral Thad Allen said BP’s efforts to remove the equipment have been delayed by local weather – not by Atlantic hurricanes or tropical storms. Admiral Allen has directed BP to bring up the blowout preventer that failed to prevent the April 20 explosion that damaged the wellhead, releasing 4.9 million barrels of oil, and the capping stack that shut in the flow of oil July 15. “We are in a weather hold right now,” said Admiral Allen. “The conditions I am seeing out here, the seas are six to eight feet. Normally that’s not prohibited to do a lot of activities. But anticipation of raising the capping stack and the blowout preventer which will be suspended at some point 5,000 feet below these vessels,” is too far over the safety margin, he said. A “fishing” operation that was supposed to bring up about 3,500 feet of drill pipe last week has not been successful. Once the failed blowout preventer and capping stack are brought to the surface, another blowout preventer from the rig Development Driller II will be installed. Meanwhile, BP and the Coast Guard do not expect any new oil to enter the Gulf of Mexico because the damaged well was sealed in with mud and cement pumped in from the top on July 15 – the so-called top kill. Still, until the relief well that the Development Driller III has been working on since May intersects the damaged well and pumps mud and cement in from the bottom, the job will not be done, all parties have said. On Friday, more of the Gulf of Mexico was opened to commercial and recreational fishing. The National Oceanic and Atmospheric Administration reopened 4,281 square miles of Gulf waters off western Louisiana. At its closest point, the area being reopened is about 185 miles west of the Deepwater Horizon wellhead. The entire area is heavily fished by fishermen targeting reef fish, menhaden and shrimp. “Because of our strict adherence to the reopening protocol agreed to by the states and the federal government we have confidence that seafood harvested from this area is free from harmful oil residues and can be enjoyed by consumers around the nation,” said Margaret Hamburg, M.D., Commissioner of the Food and Drug Administration. On July 22, NOAA reopened 26,388 square miles of gulf waters off of the Florida Peninsula, and on August 10 opened 5,144 square miles off the Florida Panhandle. The closed area now covers 48,114 square miles, or about 20 percent of the federal waters in the Gulf. The closures covered 37 percent of the gulf at the height of the spill.